Dr. Parker is also the author of the CorePsych blog. Check it out as he updates us on the latest brain science. Enjoy the interview and if you’d like further clarification or have other questions feel free to post in the comments. I am sure Dr. Parker will stop by. Q: You wrote the New ADHD Medication Rules book. Why? After years of new evaluations and follow up med checks in the office, it became clear years ago that most essential biomedically-based mind and body patterns exist outside the target range of the current diagnostic coding and treatment systems. Today, both public and professionals seek improved directions based upon data and applied science that provides more answers for office use in everyday ADHD treatment activities. New Rules introduces that new audience to the territories where brain science meets common sense. One remarkably overlooked common sense observation, detailed in New Rules, is the fact that meds must first pass through the body to arrive at the mind. But even today far too few consider that fact as a potential medication encumbrance – yet I witness that impediment everyday with almost every refractory ADHD patient. That biomedically based, metabolically driven liability is one of the main reason’s I wrote Rules. Q: There’s a myth that some believe the pharmaceutical companies made up ADHD to sell drugs. Would you mind clarifying the truth? Absolutely incorrect, – as I have seen nothing but consistent efforts by pharma to improve brain understanding on a synaptic level, and to educate providers. They’ve invested millions to understand and teach the synaptic function of the prefrontal cortex. On the other hand- Have there been problems with some frivolous docs who don’t appreciate the science? -absolutely. But neither the docs nor pharma is to blame en masse. The overriding problem is simple: pervasive denial of the current ambiguity with ADHD diagnosis – chasing the science of appearances and the absolute lack, almost complete disdain for specific biomedically-based dosing recommendations for stimulant medications. The challenges of imprecision need immediate correction. Quite likely that “made up” assertion is based upon the public’s frustration with their observations of pervasive imprecision in diagnosis and treatment with stimulant meds documented everyday– too often overlooked by too many professionals. ADHD looks “made up” if treatments don’t work or cause aberrant reactions. As Edward de Bono commented, “You can’t dig a hole in a different place by digging the same hole deeper.” The entire research, diagnostic and treatment system is based upon an unfortunate statistical view of humankind, a predominantly ivory tower, disdain for functional brain science, neurophysiology, immunology, brain function and anything beyond synaptic reverie and categorical labels. The public intuitively knows this, while professionals, in disproportionately high numbers, remain in denial, and, quite paradoxically, refuse to think about cognitive function whilst treating cognitive imbalances. My take: we are at this moment in a time window of Mind Renaissance, led by the kinds of data I have been reporting in national meetings since 1996, and in writing on CorePsych Blog since 2006. Brain data will improve the current ADHD diagnostic and treatment systems when we stop finding someone to blame, and recognize the simple fact that brain science is quite alive, far ahead of everyday practice, is still in a state of development, yet still refreshingly useful. Galileo had the telescope, but was nearly killed because his tool reported a contrary view: that the earth was not the center of our universe. Heresy and institutional orthodoxy look for opportunities to pillory those challenging their tenure on any level, especially clinically. No, I’m not Galileo; I’m just a conscientious practitioner hanging out on the frontier with multiple neuroscience Galileo’s. Q: You’ve written quite a bit on Gluten, food allergies and other food issues connected to ADHD on your CorePsych Blog. Please briefly explain how diet helps and if it is possible for diet alone to cure ADHD. ADHD can improve with many corrective measures. But with the obvious complexity of causality from genetics to food, to parenting patterns, to structural changes in education, not one intervention will seal the “cure” – even well balanced meds. Gluten is only one antigen, so the current gluten-flush, the national gluten-enthusiasm, does, in fact, work if the only offending food antigen is gluten. Reductionistic thinking also arises on the gluten side. But oversimplified gluten enthusiasm doesn’t work if individuals suffer with what I have come to call in my office, the New Jersey Trifecta, showing in this order of frequency: Milk is by far the worst offender [Win], Eggs are next [Place], and Wheat/gluten comes in as a slow third [Show]. IgG testing, held in disrepute by most traditional allergists, GI specialists and others, works in our offices about 80% of the time – actually quite a good figure if you’ve suffered with a lifetime of meds missing the mark. Why not use it if it works? 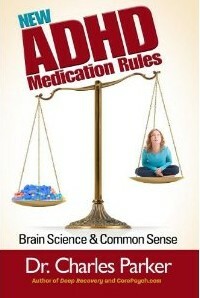 Q: There are a lot of misunderstandings about ADHD medications. Why is it important for adults with ADHD and parents of children with ADHD to understand the medications they are taking? The neuroscience of neurotransmitters is, admittedly, quite daunting – but the application of these ADHD new meds, following the necessary New Rules is street simple, and, again, based upon the common sense applications of predictable science. One simple answer, addressed in detail in my book, out in paperback this fall, is placement of far more attention to each med’s DOE, duration of effectiveness, with each person taking the med. Each stimulant med works best at a certain DOE. If you use that DOE for med adjustment the side effects and misunderstandings drop markedly. Know the DOE, find your own customized therapeutic window, and the science works – if only you work it, and target that specific DOE objective. Medication use is far more complex than chasing oversimplified labels with cookie cutter dosing strategies, and several New Rules, based upon good science, find useful application at any level of elementary understanding. Q: Which type of doctor is the best trained to diagnose and treat ADHD? Most importantly: The interested doctor. If the doctor is ambivalent, or disinterested, find someone who loves treating ADHD, and wants to learn about your specific medical expression of ADHD. I’ve met child psychiatrists asleep at the switch, many adult psychs [who appear quite categorically hooked up with labels as a group – and often have not had specific training in understanding ADHD], and pediatricians who still think, even in 2012, that kids should only be treated for academic performance. On the other hand, any of these subspecialists, including family docs, can provide heroic care, – but only if they are interested to follow the necessary, available details. The good news, some already do. The bad news: their number is less than expected. Q: In what ways does psychiatric therapy help people with ADHD? In one word: perspective. It can be helpful if the therapist recognizes the ADHD challenge and works within that improved biologically based perspective. If, on the other hand, the counselor is uninformed about the underlying biological basis of ADHD they often take the passive, Neo-Freudian view that silence will reveal those underlying “conflicts.” They don’t understand the considerable value of coaching, or CBT, of adding perspective – and that lack of structure, the lack of feedback, will cause the patient, quite reasonably, to discontinue care. Q: You talk a lot about brain science and common sense. What does this mean for people not yet familiar with your work? Brain science is indeed complicated. My job is to translate that fresh complicated science for the public and professionals, wrapped in common sense packages that have street value applications. The time for theories in the office is over, brain science shows us how to do it correctly, and all we have to do is pay attention to applying the understandable details. Said another way: the patient can’t talk precisely to the doc if neither has a clear clue of what they are talking about. Q: Please explain how you evaluate the best ADHD treatment for an individual. Bryan my friend, this one is way too complicated… let me tell you some of my tricks that I will teach anyone who tunes into any of my training. An essential imperative: ask questions based upon their reactions to changes in reality, upon context and circumstance. The ADHD ivory tower experts [Harvard, Stanford] still tell us in 2012 that ADHD is a 24×7 diagnosis, and, as I pointed out years ago on YouTube, they are completely wrong. They are label dreaming. Labels are 24×7, – brain function varies according to circumstance and changes in reality. Those details are beyond pat answers. Next, we teach the value of cognitively based questions. As it stands now I have 4 different forms of cognitive anxiety, 4 different forms of depression, 3 of which are cognitive, and that’s just a start. Without those answers most are quite lost evaluating PFC function, and often miss details that can change a person’s life. Q: About brain imaging, how does this help your evaluation process? Any new assessment tool invites categorical assumptions that can prove incorrect upon application. SPECT is useful, helpful, big steps ahead of guesswork by appearances, but does only represent the rCBF [regional cerebral blood flow], and not what’s causing the change in that rCBF. There are far less expensive data points that will tell the interested patient or practitioner significantly more on a measurable cellular level. SPECT, though still controversial, is excellent and most often helpful for ADHD diagnosis, but is rapidly becoming outdated as a preferential tool with fresh neuroscience discoveries. The problem is simple – for ADHD it’s the money not the science: SPECT is an expensive biomarker – unless you have the money [$3500] and really just want to see your brain for affirmation. On a positive note: SPECT does rule out a number of conditions [e.g. TBI], and I still use SPECT in my office. But too often some who use SPECT fall into the same reductionistic label-think category – on a deeper level of cut and paste cookie cutter findings. Just as with any other medical advice it does depend upon the perspective and training of the actual person reading the SPECT data in the office. Q: Is there hope for people diagnosed with ADHD? Several levels of hope are rapidly evolving out there on the frontier… multiple data points offer considerable promise, and prove in my offices that many don’t actually have to use pharma meds to measurably improve executive function. The most hope comes from improved diagnosis and better biomedical measurements. If you have an immune dysfunction that contributes to your ADHD neither the meds nor supplements will work effectively until that immunity is correctly diagnosed and resolved. On the other hand, resolving the food allergy, as in this example, can dramatically change any treatment outcomes. Q: What’s the one most important tip you can give someone newly diagnosed with ADHD? Quickly move past the labels. You are more than a label, and the science can help you out on many levels. Be patient, read the details and make a serious effort to become self educated – as many medical professionals simply don’t understand brain function. And don’t get mad, it’s not their fault…. the science changes require additional time, motivation, and interest. Q: What’s the funniest question an adult or child with ADHD has ever asked you? For dark humor, bar none, repeated way too often, based on label-thought: “Am I hyperactive or inattentive?” Translated for the street level: “How do I look?” That question is label driven and completely unanswerable by anyone concerned about the science. The funniest comment: this one is fresh from last week, by a teenage girl in reference to my question to break down possible procrastination: “…there are really two kinds of procrastination, starting and stopping.” Her quick reply: “I never have a problem starting, unless I don’t do it at all.” All of us, including that delightful girl, had a serious belly laugh on that one. Q: What’s the funniest question a parent with ADHD has asked you? Q: Do you have any upcoming events you’d like to share and when will your new book be available for purchase? My NewRules eBook is available now at CorePsych Blog, Amazon/Kindle, and Nook, and will be out in paperback this fall at these bookstores: http://bit.ly/rulesbooks – and in your local stores in Jan. I am working diligently on having New Rules published as an audio-book out at Audible.com in late Feb of ’13, have selected a great narrator and am underway with that project. YouTube: Stay tuned at drcharlesparker YouTube for many videos this fall; sign up for CorePsych Blog for multiple detailed short posts throughout this fall on the biomedical/meds details. My mission is to reach out and make a difference in people’s lives – and do stay tuned for the fact that I’m working on a serious surprise in the next three months regarding my book. 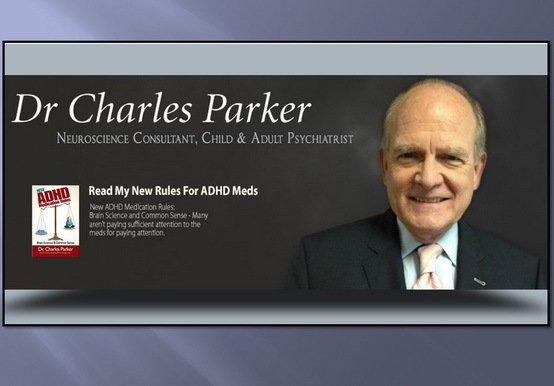 Blog Talk Radio: ADHD Meds | Straight Talk, at http://bit.ly/btr-adhdmeds These will be live on Tuesdays at 12:30 PM ET, and if you sign up for notifications there you will get them delivered to your computer for listening when you have the time. College Transitions: Coaching at CoreBrain.org – a virtual program for both high school and college young adults to make that change effectively. Thank you for your answers and your time, Dr. Parker. Readers, if you have any questions or concerns for Dr. Parker, please post in the comments. Previous post: 5 Steps To Get What You Want, Even If You Have ADHD! Next post: Sometimes You Must Fail To Succeed Even if you Have ADHD!